AG Ford is a fast-rising star in the field of literature for children. 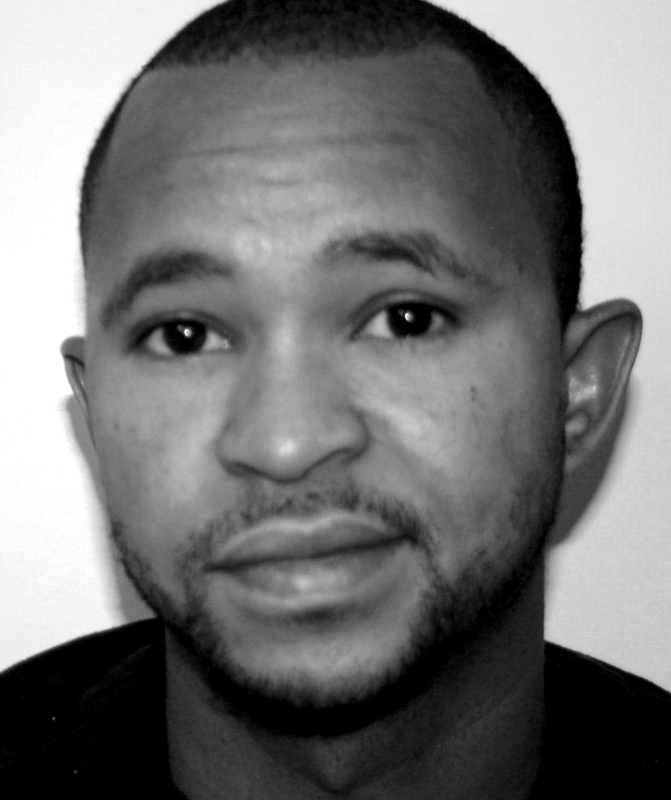 His first book, BARACK (Katherine Tegen Books, 2008), written by Jonah Winter, quickly rose to become a New York Times bestselling title almost overnight. With BARACK, AG pays a visual tribute to the man who became America’s first African-American president. Following that debut, AG created gorgeous artwork to adorn the pages of two more books. MICHELLE is the inspiring story of First Lady, Michelle Obama. FIRST FAMILY follows a day in the life of the Obama family, including daughters Malia and Sasha, and puppy Bo. Both books are written by Deborah Hopkinson and published by HarperCollins. AG attended the Columbus College of Art and Design, where he majored in illustration. During his junior and senior years, he was accepted into the Society of Illustrators student competition. College presented AG with the good fortune to study under the infamous and award-winning artist C.F. Payne. AG grew up in Dallas, Texas (Garland), where he discovered his ability to draw at a very young age. For our first featured illustrator of the Brown Bookshelf’s 28 Days Later, 2010 campaign, we present the amazing AG Ford. The first three books of your career involve the first African-American President and his family. 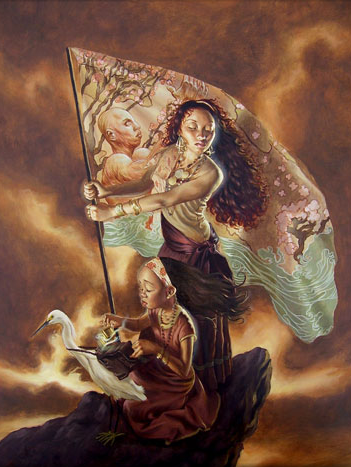 Can you talk about the significance this played in your artwork? This is an interesting question because, while an emotional attachment seems inevitable, I really tried not to think of things in that manner. I really just wanted to view the project as a documentarian and simply illustrate the text written by the author, and try to display their passion, and their vision, and the vision of my editors. I agreed and believed in the writing, so I just really wanted the illustrations to fit with the story and communicate one strong idea. A successful book was my goal. 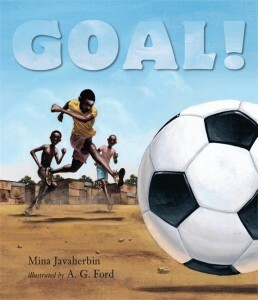 The most recent book I completed is GOAL, written by Mina Javaherbin (Candlewick Publishing, April of 2010). 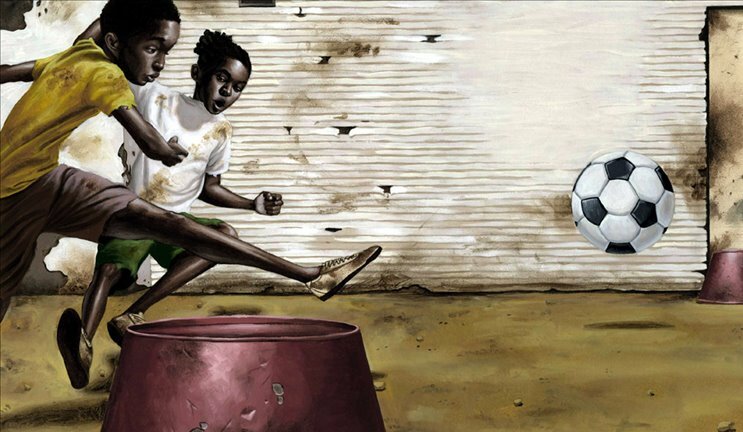 It’s the story about a group of young boys who play soccer in the shanty homes of South Africa. I had to research and spend a great deal of time thinking about the imagery in order to communicate the illustrations effectively. Textures, colors, and dark rich skin tones were all crucial in creating the art for this book. The drawings of the shanty homes had to be accurate in height, and the textures had to appear rough and worn due to weather, wind, and the everyday wear and tear that is created by the hot sun, years of rain, and rust. Dirt and dust needed to appear smoky and brutal, clothes needed to look worn out, and soccer balls needed to fly! Personality from the kids needed to accurately display a range of emotions – happy and even frightful at times – and the action poses needed to display an enormous amount of intensity. This was definitely a fun book to illustrate, though the process offered challenges at times. Still, I feel that GOAL presents some of my best work for children’s books. What primary medium do you use in your work? I use acrylics and oils primarily, more so oils lately, but I can go back in forth. Developing as an illustrator has been an ongoing process honestly, the work is never done, always trying to develop and get better. Being an artist is interesting because there is no absolute time when you reach a peak, its an endless process. Athletes usually reach a peak because of the physical limitations of the human body, but as an artist, your brain is your sword and most powerful weapon. You are always learning and becoming smarter, therefore there isn’t a limitation on how good you can get or how much you can develop. I try to stay in the studio as much as possible while maintaining my sanity. Are there any differences in the way you work with children’s book publishers, compared to your other editorial (magazine) work? I haven’t done much magazine work, but there isn’t much of a difference. Simply put, a children’s book is usually around 25 illustrations or less, while a magazine job might be 1 or 2, sometimes 3 illustrations. But you are communicating with pictures what is written, making things clear, and fun for the reader. There are major differences when doing gallery work, simply because there are no limitations on what you can create. Just a few would be Norman Rockwell, because he was a fast painter, but so accurate, I would like to see his process. Maxfield Parrish, just to see his glazing process. 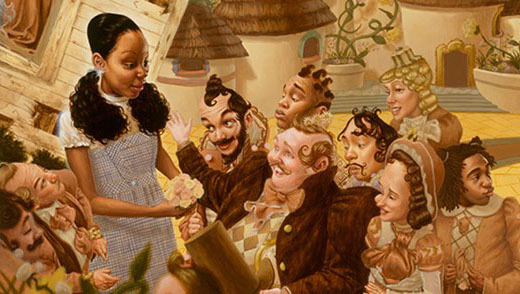 Kadir Nelson, Thomas Blackshear, or Kehinde Wiley are a few illustrators I wouldn’t mind spending a few days in the studio with just to talk about art, and see their process, that would be fun I think. What was the biggest change, unexpected result, or interesting observation you’ve noted since becoming a best-selling children’s book artist? Well, I got more work thrown my way, which is always good! And I become aware that people are liking my work to some extent. But other than that, I think it’s one of those things that happens, and I look forward to trying to accomplish that goal again and again. But I don’t think about being a best-selling artist much at all honestly, it doesn’t change the way my art looks. I’m still the same artist, and I want to get better and grow. As an illustrator who happens to be African American, do you ever feel any special pressures, or unique challenges? Please explain. I am sure not to display African Americans in a negative light. But my first few books were about the first African American president, so I didn’t really have to deal with anything negative, it was all a positive portrayal. I do a lot of thumbnails, and rough sketches, but not too many color studies, but that’s because I usually have an idea in my mind about the color. Color studies are necessary though, and I will probably do more of them with bigger personal paintings. What do you find most gratifying about being an illustrator? One thing that really led me into children’s books is that I knew I could work traditionally which is something that I love to do. I like working with my hands, and getting a little messy. The most gratifying to me is probably being able to work from home and make my own schedule. I always wanted to be my own boss and run my own business. This is a great balance of my passion and being able to basically own a small business. For our aspiring children’s book illustrators, talk about your path to publication. Well I got lucky and landed a great agent early on while in my senior year in College. But having an agent doesn’t mean you will automatically get work. You still have to be smart about your moves. I took a trip to New York for about a week and met with every publishing house that was willing to meet with me, and I happened to be in the right place at the right time and landed a book deal a few months after that. The main obstacle is to be able to battle yourself as an artist. Don’t give up, research what you are doing, and really lose yourself in the art world. Be a student of the arts, stay focused, work ten times harder than everyone around you, and be emerged in it and maximize your potential. What would be your dream manuscript? Your dream author to work with? I think my dream manuscript would be……… I don’t know yet. As far as authors go, I’m still just reading a lot of different authors, I’m not partial to anyone in particular yet, I just really enjoy a lot of different authors, and feel there is some good writing going on! My brother is probably my biggest supporter. He just really takes the time to look at my work and purchase my books. I’m sure he will always be there to look at my work and support me no matter what, he’s cool. Well I’m not sure I have a large fan base yet, but I’m working on it. But for those who are out there, they can expect a lot more personal work, big paintings! I update my BLOG with new sketches, and ideas. I really like feedback, so I encourage viewers to post comments. I will write you back on my blog and answer questions and what not. http://agford.blogspot.com. People can definitely expect to see more personal work, and learn about me from a creative perspective and as an artist, a painter, as well as an illustrator. All images used in this post are copyright of the artist and his publishers. gorgeous art, and i love the points he makes about it being an ongoing process. thanks for this! Beautiful work! Great interview. Wish you continued success, AG. I love your work AG…looking forward to more great things. I hope to meet you down the road and talk art. WOW. What I love about this month is all the new people to whom I’m introduced. I’ll be looking for more from Mr. Ford! A.G.’s artwork is so vibrant! This was such a great interview. Very beautiful work! All four of his first books should be ordered for our school library! Thanks for the interview. With both Michelle and First Family, I have routinely gone back to the book just to enjoy the art. Just beautiful. 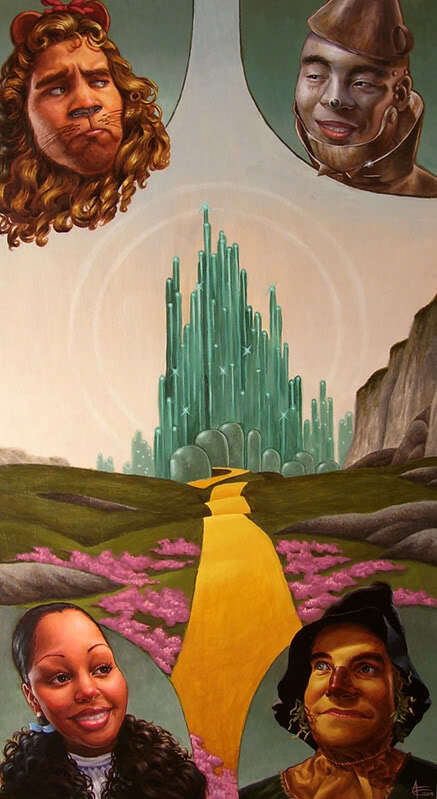 As soon as I saw the Wizard of Oz mural on A.G.’s website I fell in love. Nothing like seeing an image you grew up re-imagined so beautifully. Oh my goodness, what GORGEOUS images! Thank you for this, BBS and AG Ford. Shadra– AG illustrating The Wiz, now that would be cool! Somebody sign him up! AG Ford has an impressive professional attitude and GOAL looks amazing, beautiful, and excellent! great interview. i have seen these books and this art work before and it just seems to come to life again and again each time I see it. very interesting interview; its always fun to get the inside perspective on how talented people get their start on their view on the day to day process of work. good luck on your career going forward, i wish you much success! AG, you have true and amazing talent to say the least. May you have continued success! BIG Things to come! You are truly gifted! I love the way you never fail to thank your family for their support! Your work is very vibrant, and it draws the readers eye to the fine details of your art. I look forward to following you in your journey! Oh and I just loved your interview. AG!I can’t tell you how proud I am of you. Keep that humble personality and your talent as an artist, is just amazing. Your interview gleed the passion for the work that you do.May you have continued success. I’m very proud of you. When I look at your work I feel that you have given one hundred and ten percent of yourself. When I look at your drawings they seem so vibrant and full of life. Look at the elements of the eyes. That is a work of art. Keep it up. I’ve always known how bless, gifted, and talented you are A.G., it just warm my heart to see you continue successfully, to work, to capture, the inner and productive beauty, of images, and outstanding detells in all your illustrations. You are a portraitist, you are someone, whos art sing messages of flavor. From early on, I’ve had the honor of being able to sit, share and listen of your dreams, aspirations and future. I have seen the dedication, wisdom, hard work, and discipline balanced with such brilliance of approach and passion, you have illustrated in all your designs, and I am proud for you, and of you. I pray, you will surpass a long journey of great things in your life, and your future and I wish you great success. Oh! Yeah, your interview was awesome. Excellent work and great interview AG! Your artwork seems to move on the page like a movie. So nice to see that you are driven to become even better. I am excited to watch you progess. Continued sucess! It’s inspiring to know that even a best selling illustrator still has to study and focus. Great work AG…your work speaks volumes and every time I see it I feel inspired. God Bless and continued sucess.